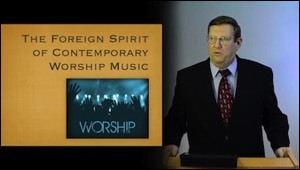 This hard-hitting multi-media presentation, published in March 2012, documents the frightful spiritual compromise, heresy, and apostasy that permeates the field of contemporary worship music. Through extensive documentation, it proves that contemporary worship music is impelled by "another spirit" (2 Cor. 11:4). It is the spirit of charismaticism, the spirit of the latter rain, the spirit of the one-world church, the spirit of the world, the spirit of homosexuality, and the spirit of the false god of The Shack. The presentation looks carefully at the origin of contemporary worship in the Jesus Movement of the 1970s, examining the lives and testimonies of some of the most influential people. Nearly 60 video clips and hundreds of photos are featured.